*Made with top-quality herbs and spices imported from around the world. *Organic, Gluten Free, Dairy Free, Non-GMO, MSG Free, Paleo Friendly. *Contain no added sodium, sugar, preservatives, coloring, flavors or anti-caking agents. *Available in singles ( 5.5 oz. sizes) or 4 or 8-packs (sampler (2 oz.) sizes only). Skip that store bought stuff! Who knows what’s actually lurking in there…besides extra sodium, sugar, preservatives and anti-caking agents! How did these seasonings come to be? Well, let’s just say it was a bit out of left field! 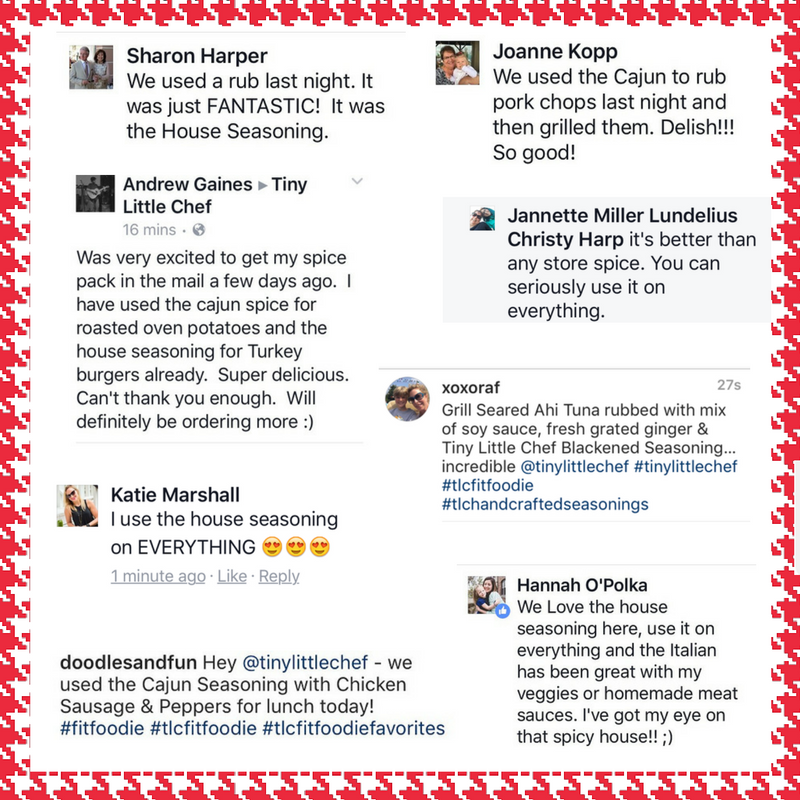 For while now I have a had a recipe membership site, where my clients pay to access over 17 years of my Chef created recipes. Well, I was giving them the recipes (some of which I have been blends for close to 2 decades! ), and they LOVED them, but I was getting questions like “These are amazing, but now what do I do with this bottle of marjoram?” and “Can you bottle these for us?”So, I did a ton of research, ordered the best herbs and spices I could find, had some bottles shipped to me, and the rest is history! Within 4 months I had sold close to 3,000 bottles! It was about that point where I decided to really run with this idea and see where it could lead. And I’m loving it! Using only the finest imported herbs and spices, you can be assured that there are no artificial ingredients, no sugar, and absolutely no additional sodium (please note that the House, Spicy House and Taste of Arizona contain Sea Salt). 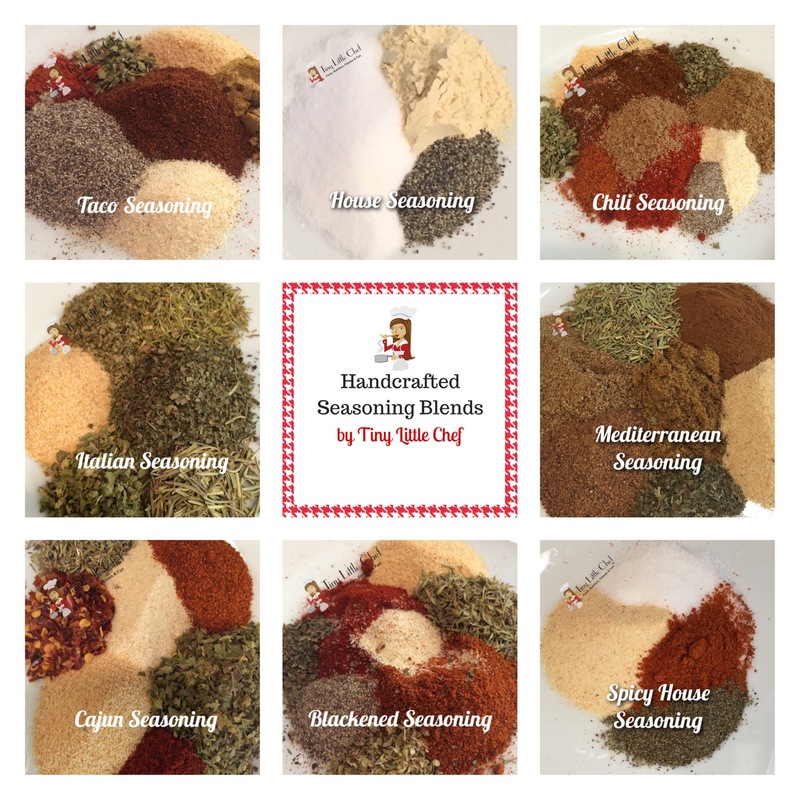 Be sure to store your Handcrafted Seasoning Blends in a cool, dry place. In a cupboard is ideal. BLACKENED: Paprika, garlic powder, onion powder, thyme, black pepper, cayenne, basil and oregano. CAJUN: Garlic powder, onion powder, paprika, oregano, thyme, cayenne pepper and black pepper. CHILI: Chili powder, garlic powder, onion powder, paprika, cumin and basil. HOUSE: Fine ground sea salt, garlic powder and black pepper. SPICY HOUSE: Fine ground sea salt, garlic powder, cayenne pepper, and black pepper. ITALIAN: Basil, garlic powder, marjoram, oregano, thyme and rosemary. MEDITERRANEAN: Cinnamon, coriander, rosemary, nutmeg, garlic powder and basil. TACO: Chili powder, garlic powder, onion powder, oregano, paprika, cumin and black pepper. TASTE OF ARIZONA: Sea salt, garlic, cilantro, cumin, coriander, paprika and cayenne.